Baconfest is right around the corner. On March 31 and April 1, the best chefs in town will gather at the UIC Forum for three bacon-filled sessions to celebrate bacon in all its forms. You can go to Baconfest! Tickets are available right now – and we’ve announced new ways to save on admission with Bacon-Only tickets for $60, Bacon Express tickets from $75 or bring a gang of five or more and save with group rates of $65 / ticket. Those rates are available for advance purchase only, so get thyself to the ticketing page to take full advantage. We just released the menu for the event and if I do say so myself, reading the list of dishes is like reading a 150-line ode to bacon. But that’s not the only bacon poetry that we want for Baconfest. Oh no – the Baconfest Literary Panel’s appetite for porky verse is rivaled only by our appetite for Bacon. So, here is our call for entries for the 2017 Bacon Poetry contest. Channel your inner Shakespeare and let those verses fly. Four (4) VIP Tickets to the session of your choice. 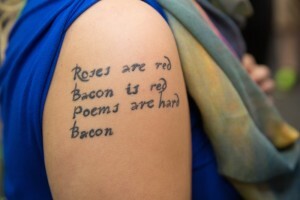 You must grant Baconfest rights to publish your poem on Baconfestchicago.com and any future anthologies of bacon poetry we publish in the future. 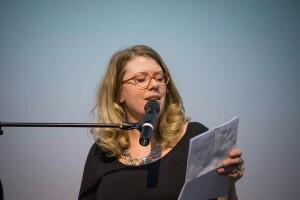 You must be willing to read your poem at Baconfest to our adoring crowds (or let one of the members of the Baconfest Literary Panel designate a reader). No Haiku. Unless it’s in Japanese. I mean, look, we appreciate a finely wrought haiku as much as anybody, but this is a serious contest for serious poems. A haiku just won’t cut it. Need some inspiration? Here are some of the winning poems from previous years to get those juices flowing. Which burns like cured pork belly on the stovetop. Lo, turkey bacon is a special kind of hell. Of briney, flavorful fat from the rasher. He wakes early, padding barefoot into the kitchen. placing it into his grandmothers old shallow frying pan. on Sunday mornings for his sleeping wife and child. of the meaning of home. All a waste of my precious time. Every minute I spend away from my porcine mistress, agony. The experience of the human condition is merely what one must endure between bacons. I am Schrödinger’s diner, caught in a superposition of states, always simultaneously eating bacon, and not. I dance the pork belly ballet. She calls to me, my pancetta princess. She calls to me, from beyond the vegetable veil. I hear her. I long for her salty, smoky embrace. To live without bacon, is not to live.